Small meeting rooms are on the rise. Often referred to as huddle rooms, these smaller spaces are becoming much more popular for impromptu meetings, brainstorming sessions and presentations for groups of two to four employees that do not require large boardrooms and collaboration spaces for the meeting to take place. Proving to be a much more efficient use of an organisations office space and real estate, these rooms are much more versatile and welcoming for smaller teams to accommodate when needing a private space to make decisions, communicate with customers and present to their peers. Because of their smaller size, they are also much less expensive to fit out, and can accommodate furniture and equipment at generally a much lower cost. VideoCentric work with organisations of all sizes to deploy solutions into small meeting rooms, huddle rooms and huddle pods, to ensure your teams get access to video communications in whatever room they choose to collaborate within. Get in touch today to find out more about our huddle room solutions or to discuss adding video to your smaller meeting spaces. So what solutions are available for the Huddle Room? With face-to-face interaction becoming much more critical in business communications whilst teams are becoming increasingly disperse, there are many Video Conferencing systems now on the market that have been designed with the huddle room and smaller meeting room in mind. 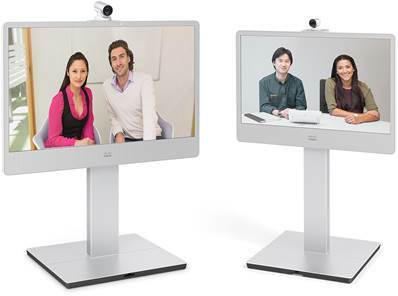 There is no longer the need to kit out a small meeting room with a system designed for 12+ people, professional Video Conferencing manufacturers such as Cisco, Polycom and Lifesize now all provide cutting-edge Video Conferencing endpoints and professional VC cameras designed specifically for rooms of 2-4 people, alongside Huddle bundles such as the Huddle Buddy from VideoCentric. 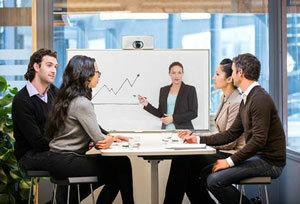 In addition to Video Conferencing endpoints designed for smaller meeting rooms, collaborative and AV technologies are also available that are more suited to the small huddle space. There is no need to equip these rooms with 85″ displays and interactive whiteboards, wireless data sharing capabilities for more people than the room can hold, and technology that just won’t be required in a room of this size. 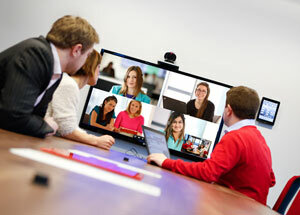 VideoCentric’s portfolio for small meeting rooms enables you to equip your huddle spaces with high quality Video Conferencing and content sharing solutions that is interoperable, secure and provides the same robust features you have come to expect from professional Video Conferencing and Collaboration solutions in the boardroom. 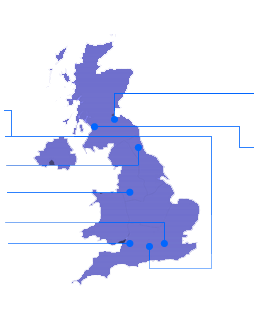 See a range of our product portfolio below, and contact us today where we can discuss various options available for the huddle space, including smaller and lower cost video conferencing solutions, interactive displays, content sharing facilities and cloud based virtual meeting rooms to help your teams become more productive, more efficient and more collaborative.